The standard procedure for the osteogenic differentiation of multipotent stem cells is treatment of a confluent monolayer with a cocktail of dexamethasone (Dex), ascorbic acid (Asc) and β-glycerophosphate (β-Gly). This review describes the effects of these substances on intracellular signaling cascades that lead to osteogenic differentiation of bone marrow stroma-derived stem cells. 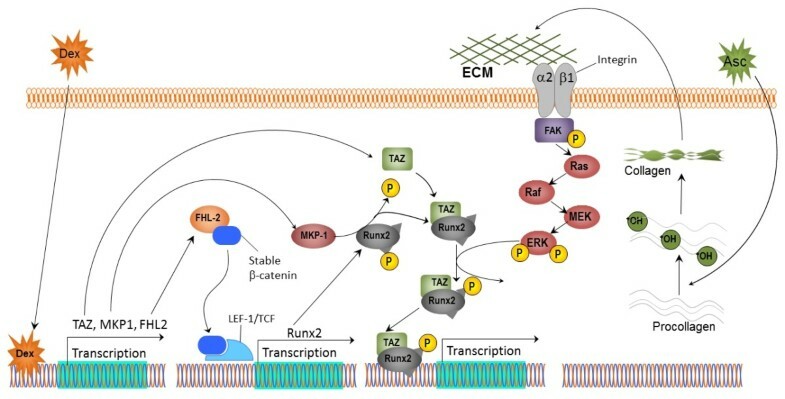 We conclude that Dex induces Runx2 expression by FHL2/β-catenin-mediated transcriptional activation and that Dex enhances Runx2 activity by upregulation of TAZ and MKP1. Asc leads to the increased secretion of collagen type I (Col1), which in turn leads to increased Col1/α2β1 integrin-mediated intracellular signaling. The phosphate from β-Gly serves as a source for the phosphate in hydroxylapatite and in addition influences intracellular signaling molecules. In this context we give special attention to the differences between dystrophic and bone-specific mineralization. Osteogenic differentiation protocols using dexamethasone (Dex), ascorbic acid (Asc) and β-glycerophosphate (β-Gly) are frequently used for many experimental approaches, including tissue engineering approaches or simply the approval of differentiation capabilities of particular cell types. Stem cells from several tissues are promising candidates for such approaches. However, only a few cell types are able to form heterotopic bone while many cell types are able to form mineralized tissue. Many studies report that skeletal stem cells (SSCs) from bone marrow and unrestricted somatic stem cells from umbilical cord blood are able to establish a hematopoietic microenvironment and to form bone after implantation [1–4]. For general information on the delicate differences between stem cells and the uncertainties about the definition of mesenchymal stem cells, please refer to the commentary of Bianco and colleagues . Furthermore, we recommend the review of Robey on cell sources for bone regeneration, which highlights the importance of SSCs in osteogenic tissue engineering . In this context, it is important to note that the prolonged culture of bone marrow stromal cells (BMSCs) can deplete the SSC pool or lead to over-dilution of SSCs in the heterogeneous BMSC population [1, 6]. In this review, we describe the latest findings concerning the underlying mechanisms involved in osteogenic differentiation of BMSC cultures under the influence of Dex, Asc and β-Gly (the combination is frequently called DAG). Furthermore, special focus is put on the difference between bone-specific and dystrophic mineralization processes under the influence of this combination. At least a 3-week period of continuous treatment of a confluent monolayer of cells with Dex, in combination with β-Gly and Asc, is required for osteogenic differentiation , demonstrating that the differentiation process does not start with an initial event that is sufficient by itself to induce final in vitro mineralization, but that Dex, Asc and β-Gly orchestrate several regulatory mechanisms over a period of time. Several approaches have been undertaken in order to elucidate the function of Dex, which have often resulted in conflicting findings due to differences in the differentiation state and the osteogenic potential of the cells. Since Tenenbaum and Heersche  demonstrated in 1985 that the optimal concentration of Dex for osteogenesis of chick periosteum cells was 100 nM, this concentration has been used in many approaches for the differentiation of cells. In a study by Walsh and colleagues , in vitro analysis of BMSCs from 30 human donors has provided evidence that a level of Dex that is similar to the physiological level of glucocorticoids (10 nM) is the optimal concentration for mineralized nodule formation. A review by Seong and colleagues  noted that both concentrations have been used at similar frequencies in research articles. Recently, Alm and colleagues  found that transient 100 nM Dex treatment for 1 week reduces inter- and intra-individual variations in osteoblastic differentiation of BMSCs. Furthermore, it was reported that Dex prevents apoptosis of BMSCs in confluent cultures  and promotes mesenchymal stem cell proliferation . The precise mechanisms of how Dex induces osteogenesis in vitro remained unclear until Hamidouche and colleagues  demonstrated that a LIM-domain protein with 4.5 LIM domains (FHL2) mediates Dex-induced mesenchymal cell differentiation into osteoblasts by activating WNT/β-catenin signaling-dependent Runx2 expression. They demonstrated that FHL2 is upregulated in response to Dex, presumably due to binding to a glucocorticoid response element in the promoter of FHL2. In the presence of Wnt3a, an activator of the canonical WNT signaling pathway, binding of FHL2 to β-catenin potentiates the transport of β-catenin to the nucleus, where it binds TCF/LEF-1 and leads to the transcription of Runx2. Evidence for direct interaction of FHL2 and β-catenin was provided by detection of co-immunoprecipitation. Previously, other groups demonstrated that canonical Wnt signaling promotes osteoblast differentiation, in part through Runx2 expression . Besides Runx2 upregulation after FHL2 overexpression, collagen type I (Col1) is also upregulated . This was demonstrated using a Runx2 defect mutant, which had no influence on Col1 expression, leading to the suggestion that Col1 also depends on FHL2/β-catenin-dependent transcriptional activation. Besides being responsible for regulating the expression of Runx2 by the above-mentioned FHL2-mediated transcriptional activation, recent findings have elucidated Dex regulation of Runx2 function via the activity of the β-catenin-like molecule TAZ (transcriptional co-activator with PDZ-binding motif)  (Figure 1). TAZ contains a coiled-coil carboxy-terminal domain that recruits core components of the transcriptional machinery and a specific domain that binds to the Pro-Pro-X-Tyr motif (where X is any amino acid) of Runx2 [17, 18]. Interestingly, in rat and murine BMSCs, TAZ co-activates Runx2-dependent gene transcription while repressing peroxisome-proliferator-activated receptor-γ-dependent gene transcription, a critical transcription factor for adipogenic differentiation [16, 18]. Hong and colleagues  demonstrated that the expression of TAZ is increased in response to Dex in rat BMSCs and suggested that TAZ is involved in the signaling pathway of Dex. Zebrafish that were TAZ-depleted did not form bone, providing further evidence for the importance of TAZ in osteoblast differentiation . It seems that TAZ is a crucial factor in the lineage decision of stem cells of the BMSC population. Dexamethasone (Dex) induces the osteogenic differentiation of stem cells by increasing the transcription of FHL-2. Binding of FHL-2 to β-catenin potentiates the transport of β-catenin to the nucleus, where it binds TCF/LEF-1 (T-cell factor/lymphoid enhancer factor) and leads to the transcription of Runx2. Dex also contributes to osteogenic differentiation by increasing the expression of the Runx2 co-activator TAZ. Additionally, Dex treatment induces the expression of the gene encoding MKP-1 (a component of the mitogen-activated protein kinase (MAPK) signaling pathway), which dephosphorylates and thereby activates the key transcription factor Runx2 via extracellular related kinase (ERK) signaling. The addition of ascorbic acid (Asc) facilitates osteogenic differentiation by increasing secretion of collagen type I (Col1), resulting in increased binding of α2β1 integrins to Col1. This leads to the phosphorylation of ERK1/2 in the MAPK signaling pathway, and a subsequent translocation of P-ERK1/2 to the nucleus where it activates Runx2 by phosphorylation. Abbreviations: ECM, extracellular matrix; +OH, hydroxylation; MEK, MAPK/ERK Kinase; FAK, Focal Adhesion Kinase; P, phosphate. Another mechanism by which Dex further induces osteogenesis is the modulation of Runx2 phosphorylation via the mitogen-activated protein kinase (MAPK) phosphatase (MKP-1) (Figure 1). In fact, Phillips and colleagues  demonstrated that Dex increases MKP-1 expression. They transfected rat dermal fibroblasts with Runx2 and found that only in combination with Dex was the expression of osteocalcin and bone sialo protein (BSP) induced, and mineral was deposited. They also ensured that this effect was not an artifact of the non-osteogenic cells but can be also observed in primary BMSCs. It was found that the upregulation of MKP-1 results in the de-phosphorylation of serine 125 of Runx2 leading to enhanced Runx2 trans-activation. This process is crucial in osteogenic differentiation and late-stage mineralization processes. Mikami and colleagues  found that both the timing of Dex administration and the concentration have significant effects on mineralization and differentiation. The osteogenic response to Dex may, at least in part, require the presence of Runx2, which is probably the reason for the contradictory results concerning the function of Dex in vitro. Whether MKP-1-dependent dephosphorylation is required for TAZ binding or whether these factors act together in any other way has to be verified by further experiments. Interestingly, it seems that both dephosphorylation of serine 125 of Runx2 and phosphorylation of other serines of Runx2 lead to increased activity and gene expression of osteogenic genes in rat BMSCs [19, 21]. In the case of Dex, however, only dephosphorylation of Runx2 has positive effects on osteogenic gene expression. By contrast, previous findings have demonstrated that several factors and events, such as contact with Col1 or extracellular inorganic phosphate, lead to Runx2 activation by phosphorylation. This divergence is explained by different phosphorylation of different serine residues, specifically the stimulatory phosphorylation of the carboxy-terminal proline-serine-threonine-rich domain of Runx2 and the stimulatory dephosphorylation of serine 125 of the amino-terminal runt domain [19, 22]. In addition to the multiple phosphorylation sites, cell type-, species- and isoform-specific differences in Runx2 expression may account for differences in the responsiveness of Runx2 to Dex and other stimuli. A further mechanism that regulates Runx2 activity is bone morphogenetic protein (BMP) signaling, which has been shown to be required for Runx2-dependent induction of the osteoblast phenotype. Phimphilai and colleagues  have determined that autocrine BMP production is necessary for Runx2 to be active and that BMPs and Runx2 interact. Binding of BMPs to their receptors elicits phosphorylation of Smads 1, 5 and 8. These Smads form complexes with Smad4 and translocate into the nucleus where they regulate gene expression of the osteogenic transcription factors Runx2, osterix and the MSX/DLX homeodomain proteins [24–26], as well as transcriptional co-activators such as p300, CBP and P/CAF [27–29]. Afzal and colleagues  found a Smad-interacting domain in the human Runx2 gene, which overlaps with the nuclear matrix targeting signal. The Smad-Runx2 interaction is an important aspect of Runx2 activity that regulates osteogenic differentiation. BMP-mediated regulation of Runx2 involves the binding and release of the homeodomain (HD) protein DLX5 to the Runx2 protein. During osteoblast proliferation, osteocalcin gene expression is repressed by the HD protein Msx2 (MC3T3-E1 in mouse)  by interacting with histone deacetylases  or inhibiting trans-activating factors  and Runx2 itself . At the onset of differentiation, Msx2 is released from the chromatin of the osteocalcin gene, and Dlx3 and Dlx5 are recruited together with Runx2. In this process, Dlx3 is bound to the HD binding site in the promoter region of the osteocalcin gene. Later in osteogenic differentiation - that is, during matrix mineralization - Dlx3 is replaced by Dlx5. From these results, Hassan and colleagues  concluded ‘that multiple HD proteins in osteoblasts constitute a regulatory network that mediates development of the bone phenotype through the sequential association of distinct HD proteins with promoter regulatory elements’. Further evidence for the BMP2-Runx2 interaction is provided by the finding that inhibition of BMP signaling disrupts the ability of Runx2 to stimulate osteoblast differentiation in mice, leading to the suggestion by Phimphilai and colleagues that autocrine BMP production is necessary for Runx2 activity in murine stem cells of the BMSC population . Asc is required as a cofactor for enzymes that hydroxylate proline and lysine in pro-collagen (Figure 1) . In the absence of Asc, proline cannot be hydroxylated and collagen chains are not able to form a proper helical structure . Therefore, the role of Asc in osteogenic differentiation is mainly attributed to the secretion of Col1 into the extracellular matrix (ECM). Jaiswal and colleagues  determined that the best results for osteogenic differentiation of human BMSCs are achieved with 50 μM ascorbic acid-2-phosphate, a more stable analogue of Asc under standard culture conditions. Xiao and colleagues  proposed a model to explain the role of ECM in the induction and maintenance of osteoblast differentiation: ‘(1) Osteoblasts must be in contact with a collagen-containing ECM before they can differentiate. (2) Osteoblasts bind to this ECM via interactions between col1 and α2β1 integrins. (3) Integrin ligand binding activates MAPK signaling and related pathways that transduce signals to the nucleus. (4) Runx2 is phosphorylated and activated by MAPK, thereby allowing it to stimulate osteoblast differentiation by increasing transcription of osteoblast marker genes such as osteocalcin’. This was demonstrated by the absence of osteogenesis in pre-osteoblast (MC3T3-E1 mouse pre-osteoblasts) cultures treated with collagenase, as well as in cultures in which α2β1 integrins were suppressed [36, 37]. The importance of the ECM is further highlighted by the finding that the ECM proteins Col1 and vitronectin are sufficient to induce osteogenic differentiation of human BMSC cultures , and that unrestricted somatic stem cells from human cord blood undergo osteogenic differentiation in spheroid microtissues due to contact between cells and the ECM, without the addition of Dex, Asc and β-Gly [39, 40]. Further reasons for the spontaneous osteogenic differentiation of microtissues and their potential use in tissue engineering have been reviewed by our group . The precise mechanism of the MAPK/extracellular related kinase (ERK)-mediated activation of Runx2 remained unclear until the finding that nuclear kinases interact directly with the chromatin of target genes in murine MC3T3-E1 cells [42, 43]. Specifically, ECM interaction with the above-mentioned integrins activates the MAPK pathway, leading to accumulation of P-ERK in the nucleus. Together with Runx2, P-ERK binds to osteocalcin and BSP gene promoters to induce osteoblast-specific gene expression. The proximal promoter of the osteocalcin gene has two osteoblastic cis-acting elements (OSE2a and OSE2b), which are the targets of Runx2 and are both necessary for the expression of osteocalcin [42, 44]. Immunofluorescence laser confocal microscopy and chromatin immunoprecipitation analyses have revealed that P-ERK, together with Runx2, selectively bind to these regions. A comparable mechanism was found for the regulation of BSP expression . However, regardless of peak Runx2 protein levels and DNA binding activity at the early stages of differentiation, binding of Runx2 to its genomic targets is blocked. Different mechanisms have been attributed to this block and the later release of Runx2. Bialek and colleagues  demonstrated that Twist proteins have an anti-osteogenic function that is mediated by the Twist box, which interacts with the Runx2 DNA-binding domain to inhibit its function in mice. As mentioned above, Runx2 is both negatively and positively regulated by Dlx3, Dlx5 and Msx2. Many osteoblast genes in mouse cells, such as those encoding osteocalcin, osteopontin, BSP and Col1, contain functional HD regulatory elements that are regulated by Runx2 in combination with Dlx3 and Dlx5 . For example, Dlx5 binds to an HD protein binding site upstream of the two Runx2 binding sites of BSP [46, 47]. Whereas Runx2 is constitutively bound to the BSP gene promoter in the presence or absence of Asc, Dlx5 only binds to its HD binding site in differentiated osteoblasts that have been treated with Asc. Total Dlx5 protein levels are similar in differentiated osteoblasts and controls, and thus an increased affinity of Dlx5 for the chromatin of the BSP gene can be attributed to Asc-induced intracellular signaling. β-Gly plays an important role in the osteogenic differentiation of BMSCs. Nevertheless, its use in the osteogenic differentiation of stem cells and osteoblasts has led to many false-positive results. Besides expression of some surface markers, one of the minimal prerequisites that a cell has to fulfill to be considered a mesenchymal stem cell is the capability of osteogenic, adipogenic and chondrogenic differentiation. But one has to be careful when proving this three-lineage differentiation capability. Some of the stains used to prove any of the three differentiation capabilities may lead to false results. When cells that are incapable of osteogenic differentiation are treated with high concentrations (≥2 mM) of β-Gly they produce dystrophic mineralization or non-apatitic mineralization, which can be detected by Alizarin Red S or Von Kossa . However, detection of mineralization in confluent monolayers by Alizarin Red S or Von Kossa is often the only evidence provided for osteogenic differentiation potential. If positive results for adipogenic and chondrogenic differentiation are observed for the same cells, then these cells are falsely declared to be mesenchymal stem cells. Alizarin Red S and Von Kossa cannot distinguish between different Ca/P minerals. Lammers and colleagues  therefore demonstrated how a complex set of methods can be used to determine the mineral content of a sample. They used quantitative wavelength-dispersive X-ray spectroscopy to determine whether a bone-specific Ca/P ratio (1.67) is present in the sample, transmission electron microscopy for the characterization of hydroxylapatite-specific crystal growth, selected area electron diffraction analysis to compare diffraction patterns, and Raman spectroscopy to compare the phosphate-oxygen bond of different calcium-phosphates. One of these methods is particularly important for distinguishing between dystrophic mineralization, a product of cell death, and active mineralization of the matrix, and therefore for avoiding false-positive results for osteo-specific mineralization. With transmission electron microscopy, one can distinguish between oriented, hydroxylapatite-specific, needle-shaped crystal growth and unorganized Ca/P depositions (such as amorphous Ca/P). Despite being the source of phosphate needed to produce the hydroxylapatite mineral (Ca10(PO4)6(OH)2), recent findings have shown that inorganic phosphate (Pi) acts as an intracellular signaling molecule to regulate the expression of many osteogenic genes, including the osteopontin gene (in murine cementoblasts) [50, 51] and BMP2 (Figure 1). For this regulation, phosphate enters the cell and influences cell function. The activation of the ERK signaling pathway by Pi is biphasic and is mediated by two independent phosphorylations of ERK separated by a time interval of several hours. Only after the second phosphorylation does ERK exert its function on osteogenic gene expression. Inhibition of ERK completely inhibits osteopontin gene expression  and the increase in BMP2 mRNA in response to Pi . This shows that ERK signaling is necessary for Pi-mediated increased BMP2 expression. In addition to the ERK-mediated increase in BMP2 expression, Tada and colleagues  also demonstrated that Pi increases BMP2 expression by activation of the cyclic-AMP/protein-kinase-A pathway. Interestingly, they also demonstrated that both pathways operate independently of each other. It appears that FHL2 is a crucial factor in the osteogenic commitment of BMSCs and that the key event by which Dex induces osteogenesis is the upregulation of FHL2 expression. FHL2 induces the expression of the master osteogenic transcription factor Runx2. Furthermore, Dex leads to the upregulation of TAZ, which binds to Runx2 in the nucleus where it regulates osteoblastic differentiation by recruiting core components of the transcriptional machinery. Additionally, Dex induces osteogenic differentiation of BMSCs by increasing the expression of MKP-1 (a component of the MAPK signaling pathway), which dephosphorylates and thereby activates Runx2. The addition of Asc facilitates osteogenic differentiation by increasing the secretion of Col1, resulting in an increased binding of α2β1 integrins to Col1. This in turn leads to the phosphorylation of ERK1/2 in the MAPK signaling pathway and subsequent translocalization of P-ERK1/2 to the nucleus, where it binds to Runx2 and induces gene expression of osteogenic proteins. β-Gly facilitates osteogenic differentiation by being the source of phosphate for hydroxyapatite and by the phosphorylation of ERK1/2. This review was supported by the Deutsche Forschungsgemeinschaft (DFG) grant HA 3228/3-1 and by the ‘Stiftung für Altersforschung’ of the Heinrich-Heine University Düsseldorf.